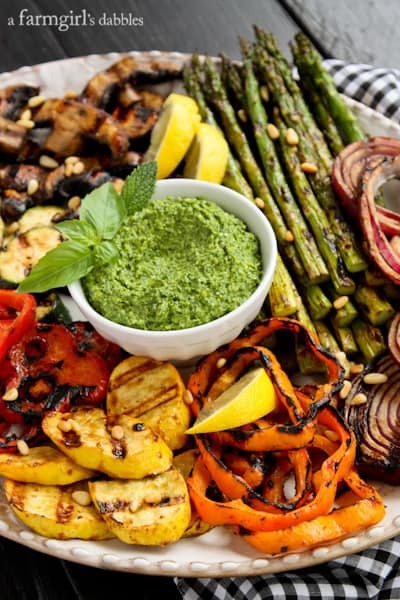 Do you get giddy, like I do, when your eyes lock in on a big, colorful platter of grilled veggies, fresh from the garden or local farmer’s market? Is your happiness magnified, like mine is, when you note there’s also a vibrant tasty dip included, made from just-picked herbs from the backyard? Well then, welcome to this plate of summer’s fresh garden bounty. 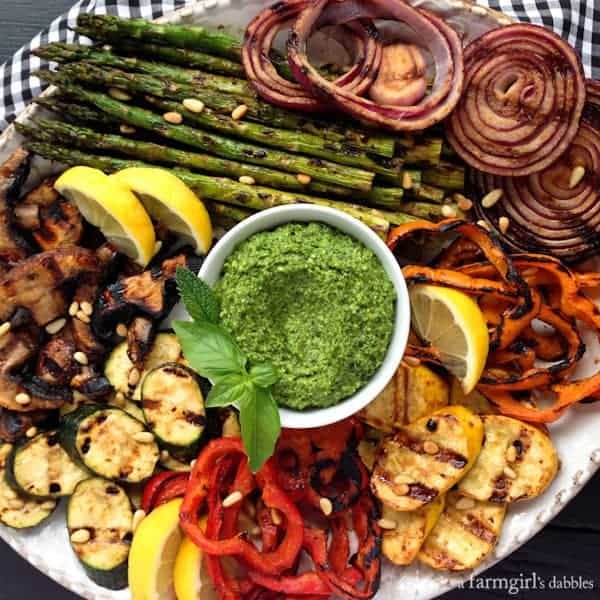 These Miso-Butter Grilled Veggies with Basil-Mint Pesto glorify this wonderful season and make the perfect appetizer or side dish for any summer gathering! 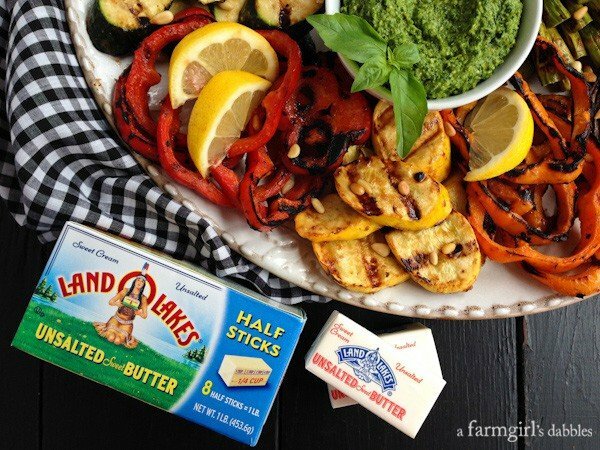 I created this recipe for Land O’Lakes and their Kitchen Conversations about butter. After attending a local event with this group here in Minnesota last week, I feel even more honored to be working with this company. 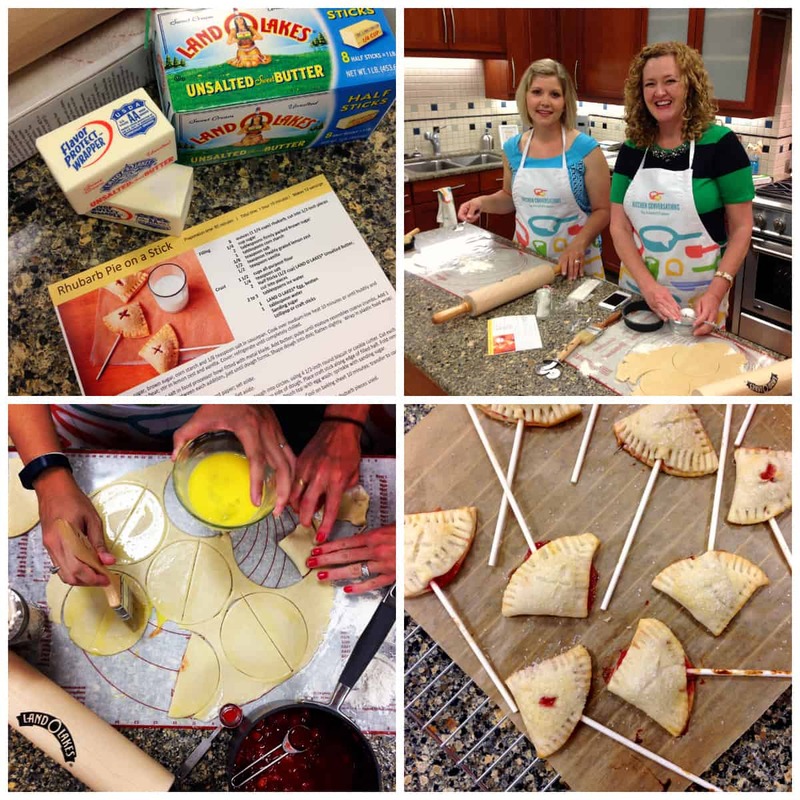 To learn more about “Simple Goodness on the Farm”, with my visit to the Land O’Lakes headquarters and a Minnesota dairy farm, read on after the recipe. 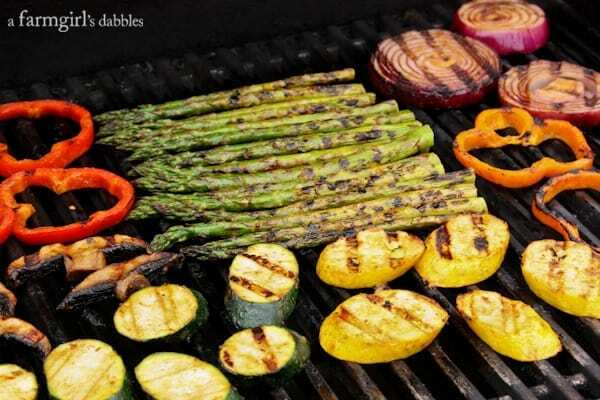 Grilling is a surefire way for our whole family to get their proper intake of vegetables. Perfectly caramelized and wrapped in smoky goodness, they are hard to resist. This is one of the biggest benefits of our warmer weather months, when our grilling increases to a nearly every day occurrence, thanks to my husband’s devotion to grilling. Blake has found his calling out there on our shaded backyard deck, and has made fast friends with his two Webers (one gas, one charcoal) and Big Green Egg. When I ran this miso-butter grilled veggies idea past him, Blake was all in. 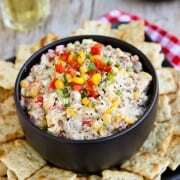 For more awesome summer grilling, be sure to check out our favorite grilling recipes! You can always find unsalted Land O Lakes® Butter in our fridge. Always. I love its pure sweet cream flavor, and I highly recommend having at least one box of Land O Lakes® Unsalted Butter in Half Sticks available at all times. So many recipes call for a half stick of butter, and Land O’Lakes makes it ultra convenient to grab just one pre-measured half stick. These smaller individually wrapped portions are wonderful for easy kitchen prep and also ensure that each package is at its freshest. This recipe calls for a whole bunch of fresh summer vegetables, plus a flavor-filled combination of one Land O Lakes® Unsalted Butter Half Stick and a bit of miso paste. What is miso paste, you ask? Well it’s only one of the hottest ingredients out there right now. I’ve been seeing it more and more on restaurant menus over the past year, so I picked some up awhile ago to play with. It had been ages since I first tried a lovely miso soup, and I knew it was time to get reacquainted with this traditional Japanese seasoning. Our girls weren’t too excited to learn that miso is actually fermented soybean paste. I agree, that doesn’t sound nearly as enticing. But once I told them that soy sauce, one of their favorite Asian condiments, is actually the liquid pressed from fermented soybean paste, their concerns were calmed. A little bit, at least. They were still skeptical. Last year I planted more basil than usual. And it produced better than normal. That left me with a ton of fresh basil, that I’m happy to report that I wasted not one little leaf of it. We found new ways to incorporate it into so many of our meals, plus we made a whole lot of fresh pesto. It was an awesome way to clean out my random assortment of half-used bags of nuts. But the biggest bonus was freezing ice cube trays filled with the wonderful green stuff, and then placing the frozen pesto cubes in a freezer bag to use all winter long, as it’s excellent for a quick and flavorful meal. I added some mint to my basil pesto this time and quickly learned that I’ll do that again. It’s wonderful. And if you also grow mint, you’ll know what a crazy garden plant it is. It grows and spreads so prolifically that some call it a pest. I’d never go so far as to say that, as I’ve learned how to manage it. And our family simply adores it too much to get rid of it. We love to add mint to salads, and to ice water, lemonades, and teas. This basil-mint pesto was meant to be in our life. Combine all ingredients in a food processor and pulse until thoroughly chopped and combined. Adjust salt to taste. Refrigerate until ready to serve with grilled vegetables. Heat grill to high (about 520°). Make sure grates are scrubbed clean and then oiled. To oil the grates, add some canola oil or olive oil to a small bowl. Then fold a heavy paper towel a few times to make a smaller square. With a tongs, grasp the folded paper towel and dip it into the oil until the paper towel is drenched. Then run the paper towel over the grates, repeating until all grill grates are thoroughly oiled. In a medium microwave-safe bowl, gently melt the butter. Let cool just a bit before adding miso, honey, and vinegar. Whisk to fully incorporate. 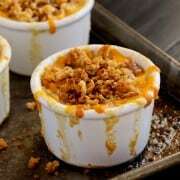 Place prepared veggies on a large rimmed baking pan. If you want to serve the vegetables grouped on a platter as shown in the photos, it helps to keep them grouped according to variety on the pan, and on and off the grill. Drizzle miso-butter mixture over veggies and gently incorporate it evenly throughout the veggies. It works best to just use your hands. If making the full recipe, this amounts to alot of vegetables to grill. It works best to grill them in two or three batches, depending on the size of your grill. Place vegetables on grill grates in a single layer and then immediately turn heat down to medium high (about 475°) and grill for about 4 minutes, until you have nice char marks from the grates. Flip vegetables and grill for about 6 more minutes, or until vegetables are nicely softened and beautifully charred on the second side. The first side does not take as long because the grill is hotter, giving you a quicker char. Remove vegetables to a clean pan or platter. Continue grilling the remaining vegetables, if grilling in batches. To serve a big platter of vegetables, place a small bowl filled with the basil-mint pesto in the middle of the platter. Then group vegetables around the bowl. This platter is best served when vegetables are still warm, when they still have some crispy char from the grilling. 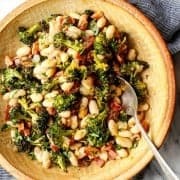 Place a few wedges of lemon in with the vegetables for squeezing over the top, and sprinkle vegetables with freshly cracked black pepper and pine nuts. 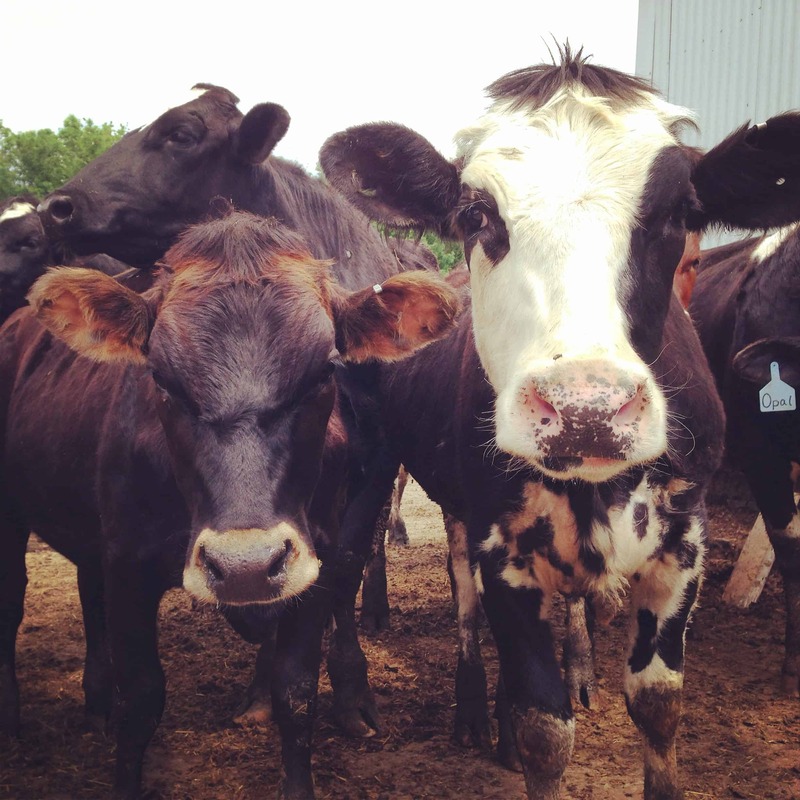 What an opportunity, to visit a small local Minnesota dairy farm. To talk with the owners, learn about what it takes to do their job, and walk through their lush green pastures. And. To gaze into the eyes of their cows. I find them to be such fascinating creatures! 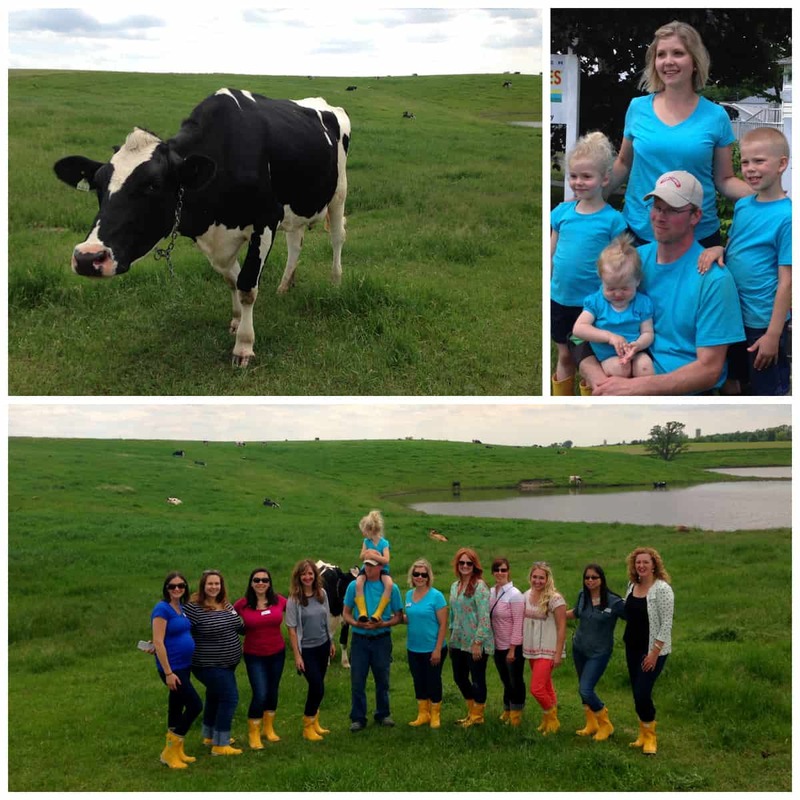 The farm that we visited is part of the Land O’Lakes farmer-owned cooperative, supplying 550 gallons of their cows’ fresh milk each and every day. Bursting with pride, this young family was so happy to show us the product of their long hours, hard work, and obvious devotion to dairy farm life. It was fun to learn that this family names each and every cow on their farm. I was amazed at their ability to tell me each cow’s name without even looking at the names on the ear tags. And they have 75 cows! Meet Helen in the upper left photo. She was a lady full of curiosity and personality, and gave our group plenty of laughs. 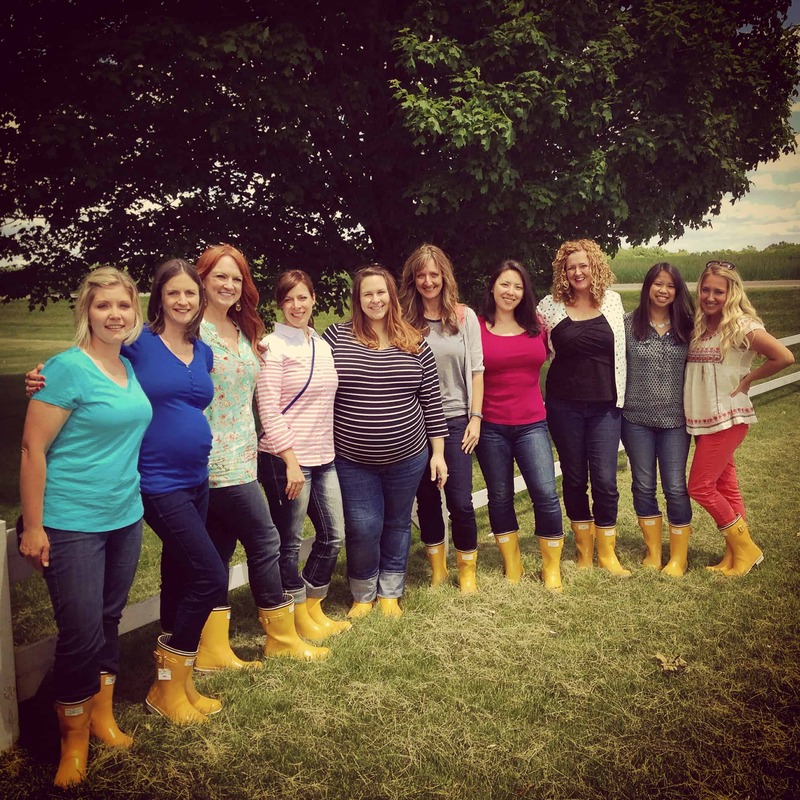 After a day on the farm, we visited the Land O’Lakes headquarters. Employing 10,000 people nationwide (about half are here in Minnesota), Land O’Lakes is one impressive company, and the only national brand of butter available in all 50 states. (To watch how Land O’Lakes butter is created, see this episode of Unwrapped from Food Network.) Besides producing all the different varieties of dairy products we see every time we shop for groceries (butter, milk, cream, cheese, sour cream), they are also behind some interesting items I wasn’t aware of. Land O’Lakes creates powders for Hershey’s, plus the awesome cheesy powder you lick off your fingers when eating Cheetos. And with the Purina brand, they are the #1 zoo food provider in the world. 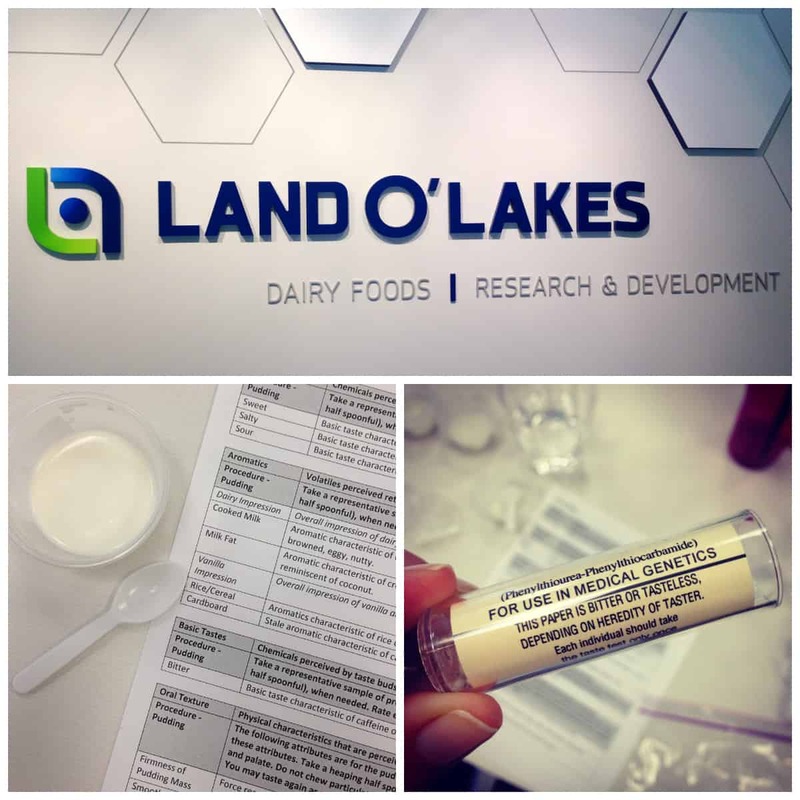 It was incredibly interesting to walk through the doors of Research and Development at Land O’Lakes. At every turn there were scientists and lab coats and shiny stainless steel tools and tanks. We learned about the time intensive process of their development of new products, and the collaboration it takes with the Test Kitchen to finally see the product available on store shelves. Land O’Lakes employs a tasting panel of individuals who are trained experts in the sensory properties of food. Think appearance, aroma, flavor, texture, and much more. All new products are first tasted by this panel, and then by a consumer group. We got to see a little bit into this world with a taste testing of milk and pudding. And then we were able to test our taste buds, to see how sensitive they really are. I turned out to be a supertaster, one who experiences the sense of taste with greater intensity than average. I would have been surprised if I wasn’t, as many of my friends and family like to joke about how much I enjoy food. Then we were off to tour the Land O’Lakes Test Kitchen. Becky, the Director, first showed us the kitchen facility set up for food service work. Certified by the state of Minnesota, this special kitchen meets all the requirements for food safety in restaurants and schools. Its decor was white and stainless steel, very commercial kitchen-like. Then we spent some time in the cozier, more home-like, Test Kitchen area. Here there are 4 complete kitchen bays set up for testing recipes. The bays have different oven types so recipes can be tested on both gas and electric. And we even got to bake there. Rhubarb Pie on a Stick! 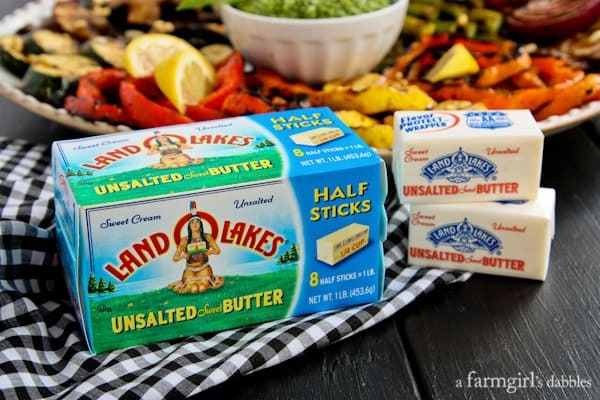 Disclaimer: A Farmgirl’s Dabbles has partnered with Land O’Lakes for an exclusive endorsement of Land O Lakes® Butter for their Kitchen Conversations blogger program. This blog post is sponsored by Land O’Lakes. Have you tried this recipe with white miso? I made the most delicious pesto yesterday! I used basil, garlic, pistachios, olive oil, parmesan, and lemon. Served with golden brown tofu cubes and salad. Love this recipe, Brenda. It’s veggie season, too, YAY! Great recap. Love LOL butter! What a fun trip and you can’t go wrong with grilled veggies. They look great, I am already thinking about what kind of sandwich I will make. This looks so wonderful! The pesto just takes it over the top! I LOVED (!!!) your miso-butter grilled veggies. Seriously, so good! It makes eating a ton of vegetables very easy. Loved seeing you in MN and I will see you soon on my turf! Everything is BETTER with butter. And everything is BETTER with pesto. Those grilled veggies are getting first class treatment. I love the photos of everyone by the way. 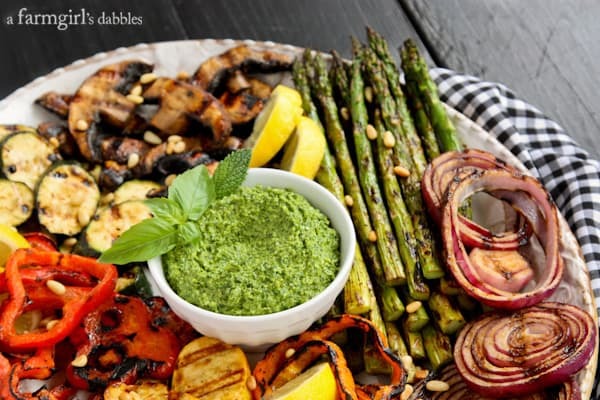 There’s just nothing better in summer than veggies on the grill, is there? And that pesto! Yummy!! Loved learning more about Land o’Lakes, too. It’s always been my go-to brand and is always, always in my fridge. I’ve been on a total miso kick lately. I’m drooling at the thought of miso butter. Be still my heart!! Thanks, Lauren. I’ve been finding that a little spoon of it tastes great in so many things! This plate of veggies looks gorgeous! I want to devour the whole darn thing. :) Looks like you had a fantastic trip with LOL! Thanks, Stephanie. It really was a great event, and fun that it was local! Thanks, Julie. That’s something that I keep thinking about, too. The employees have such pride and enthusiasm. Love it! I am not kidding…these are the prettiest veggies I’ve ever seen! Not to mention, they are delicious!!! I’m going to have to fire up that grill! Absolutely love this healthy spread! So delish without any guilt! Always looking for ways to change up regular pesto! Love the added miso paste. Whoa! Such a great idea to add miso! The flavor is subtle, but pretty darn awesome! Bring on the veggies! Loved seeing you! I love the addition of the miso flavor!